Thankfully, Amazon’s bestseller list indicates that things are back to somewhat normal (i.e. adults are reading young adult novels again), as the craze seems to have subsided somewhat. Park Slope-based actor and comedian Monica Hammond was smart enough to hop on the trend while the boat’s still afloat. This being Brooklyn, she gave the genre (if you can call it that) a DIY twist of her own. Hammond used her design and illustration skills to create her own coloring books under the name Curious Custom, and hosts her very own Coloring Club. Participants gather at a bar on a slower night, color, and drink together once a month (there have been three meet-ups so far). 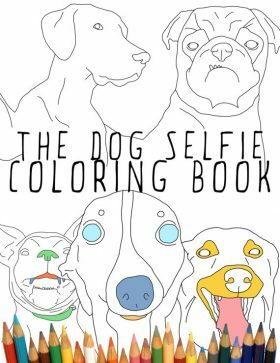 The term “adult coloring book” is a bit confusing—and surely to some, disappointing and misleading—as the average adult coloring book is stuffed with squeaky clean images of flowers, mandalas, and other basic designs (sorry– what I meant was “stress relieving patterns”). There’s rarely anything truly befitting of the kind of “adult” label you might find at your local video store (RIP). While some people might be satisfied with these rather wholesome tropes, others may be wanting something more colorful to push their crayon into. Hammond wasn’t exactly clued in to the coloring book trend when she began Curious Custom. 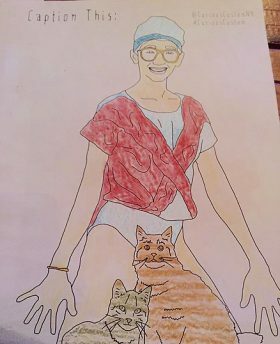 But after she went out and got herself a digital stylus and tablet as an “impulse buy,” she realized that her drawings looked a lot like images that could be found in a coloring book. So she jumped right in, did some research, and realized she could be onto something here. Since starting her venture, Hammond’s been asked to create custom coloring books for everything from weddings to hotels. She recently published her first coloring book called Love is Love: A Proud Coloring Book which features images from the NYC Pride Parade that she hand-drew from photographs that she snapped while attending the parade. That means that her images were drawn from actual, local queer people (and yeah, maybe the occasional enthusiastic straight teen girls from Long Island who, like, totally think that “Love Wins”), which in our humble opinion is a much cooler way to depict Pride than most others we’ve seen. For those of you who gotta have a drink with your crayons (we feel you), Hammond has arranged for drink specials at her Coloring Club. And they don’t mess around– when I happened upon her event at the Bierhalle recently, they were doing a buy-one-get-one special, but with huge steins of beer you practically had to carry with two hands. So you know it’s real. Tonight, Hammond’s Coloring Club meets in Williamsburg for the first time, which might very well be a perfect location considering that the neighborhood seems to be crawling with people who’d prefer to ignore their problems and do something fun. (Well, maybe that’s everywhere else too.) New York Distilling Company will play host as a zone that’s no stranger to interesting events: last year, they hosted an immersive production of Macbeth inside the distillery, complete with cocktails a-plenty. Trust that these drinks will be similarly generous: it’s said the distillery’s adjoining bar The Shanty is home to one of the city’s strongest cocktails. 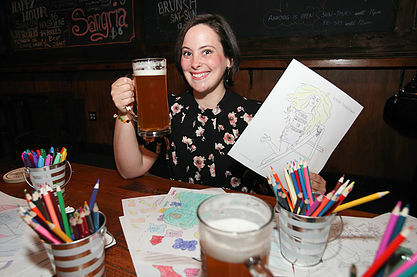 Hammond’s looking to expand her Coloring Club across several bars throughout Brooklyn with meet-ups happening three to four times a month. She also has some new book ideas brewing– one, potentially called “Broadway Babes” is informed by Hammond’s parallel career working for a Broadway producer. You needn’t sharpen your dance skills for that, but be sure to hone those crayons. Coloring Club is happening tonight, Wednesday August 10, 7:30 pm at New York Distilling Company, 79 Richardson Street, Williamsburg: $5. Also Sunday September 7, 7:30 pm at Berg’n in Crown Heights.